Seahawks running back Marshawn Lynch. Let's see if this works: I’m writing this so I won’t get fired. Eh, doesn't really have the same ring to it. Maybe I need to add the sunglasses? 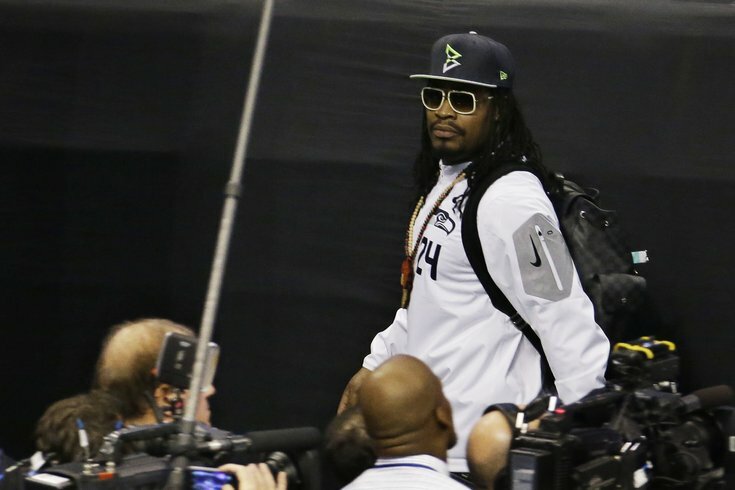 Marshawn Lynch, who first became known to those outside the football world for his rumbling touchdown in the 2011 wildcard game against the Saints or due to his obsession with Skittles, was reportedly threatened with a $500K fine by NFL Commissioner Roger Goodell if he failed to speak with reporters at Tuesday’s Super Bowl Media Day. Earlier this season, he was fined $100K for failing to speak to the media after a game, and since then, he’s graced the media with his presence when required, although hasn’t seemed interested in actually answering any of their questions. Some find it humorous, almost endearing. Others get annoyed. At least he’s being honest, which is more than you can say about some pro athletes and how they interact with the media. And Howard Eskin was the one egging on Lynch? Why is he even there? Why is any Philly media there? Lynch “spoke” for all of five minutes before leaving the microphone. Whether or not Lynch is disciplined - verbally or monetarily - is still to be decided, but it appears as though his presence was enough to avoid being fined. 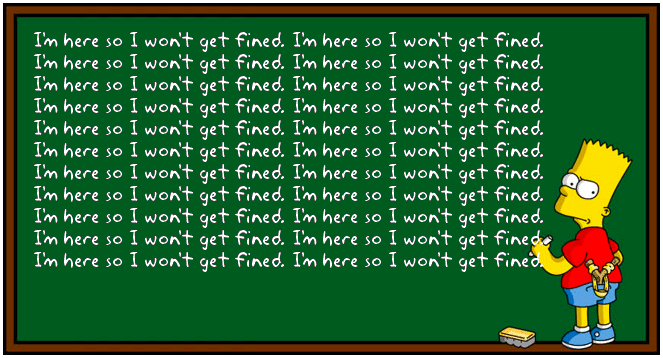 Word is Lynch won't be fined for today. He was available. If Lynch refused to speak, his fine would have been tied for the fourth largest in NFL history. I don’t mind one bit when players act like this, especially when in opposition to someone like Goodell. who will threaten to fine a guy like Lynch half a million dollars for not speaking. If you remember, that’s the same amount Patriots coach Bill Belichick had to pay for literally cheating (Spygate not Deflategate). It’s also what Colts owner Jim Irsay was fined for “violating the league’s personal conduct policy” - not to mention breaking the law - when he was pulled over for DUI and police found thousands of dollars worth of pills in the car. The real question is whether or not Lynch will wear those all-gold cleats he was prohibited from wearing in the NFC title game. Or if he scores a touchdown, will he celebrate with what’s become his signature move - and has also resulted in him getting fined? Must be nice to have that Skittles money. Russell Wilson, when asked what one NFL rule he would change: "I wish everybody would stop fining my man Marshawn." Richard Sherman: "Every one of the NFL's personnel should be obligated to speak weekly." Mentioned Goodell specifically. Love this from Sherman: "Putting Lynch in front of the press is like putting a reporter on field and asking him to tackle Adrian Peterson." He also said he thinks his wife “has the best booty ever.” Media Day, ladies and gentlemen. Bennett also compared his beard to those of other "good guys" throughout history, such as Moses, Jesus and ... Ghengis Khan? Maybe I'm reading too much into that quote, but it seems like a veiled shot at Goodell and the NFL. Carroll's basically saying that the league, by making all the players follow the same protocol, is stripping them of their individual identity, and thus treating them more as objects than as human beings. That would be consistent with the way the NFL has treated player injuries, specifically concussions, over the years. Okay, enough of that. It's Media Day. We're not really supposed to be talking about football, right? The Patriots also met with the media on Tuesday, but they weren't nearly as fun as the Seahawks. For the most part, they said about as much as Marshawn Lynch, but used a few more words in doing so. And he's right. I mean, if I were in the Patriots position, knowing full well that a slew of Deflategate questions were coming, I wouldn't much want to talk to the media either. Then again, Bill Belichick didn't seem interested in answering any of your questions. 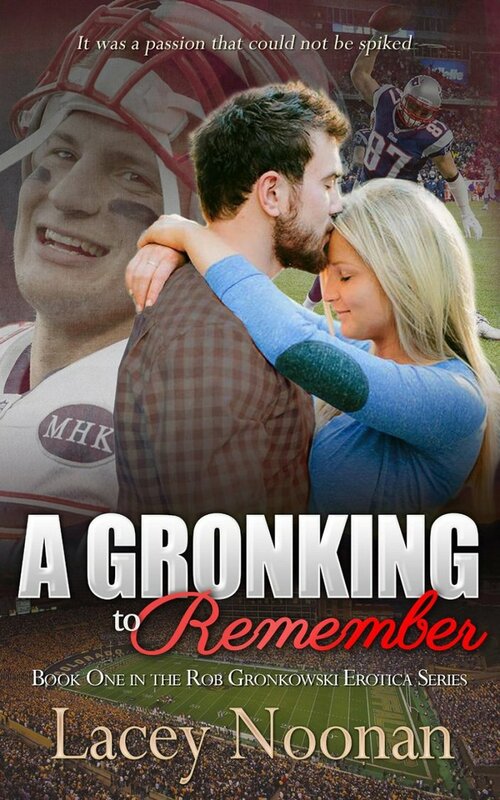 Then there was Rob Gronkowski, who read an excerpt from "A Gronking to Remember," the fan-fiction erotica novel about the Patriots tight end. It's a real thing, and it came out last month. Thank god that's over with. Now back to the serious stuff, like who handled the Patriots' balls and whether or not Brady was able to feel a difference when he gripped them. Can't we just play some football already?